One year ago, the Financial Stability Board’s Task Force on Climate-related Financial Disclosures (TCFD) released its recommendations to guide companies and financial organizations in the assessment and disclosure of climate-related risks and opportunities. Greeted with overwhelming support from the financial community, the TCFD included a recommendation to conduct and disclose climate-related scenario analyses to inform investors’ and companies’ decisions on climate issues. Investors are understandably eager for this information. We found 22 disclosed climate-related scenario analyses published since the recommendations were released in June 2017 and spotted several trends. For climate-related scenario analysis to support a market-wide shift towards investing in a low-carbon economy, not only do climate-related scenario analyses need to become standard practice for a much wider swath of businesses, but they also need to become more comparable and transparent to facilitate better decision making among investors and companies. Which Businesses Are Disclosing? And How? 1. Most disclosed scenario analyses come from the oil and gas sector. As pioneers in scenario analysis, oil and gas companies including BP, Royal Dutch Shell and Equinor, still lead the way in terms of volume (see below figure). Mining companies such as BHP and Glencore have also used scenario analysis for many years. Driven by a swarm of shareholder resolutions, however, utilities are also starting to conduct and disclose climate-related scenario analyses. Even banks, whose loan portfolios often have exposure to fossil fuel companies and other climate change-exposed industries, have gathered together to tackle TCFD-style scenario analysis, though few have actually disclosed results. We also found one analysis from the transportation sector, specifically railroad transportation. 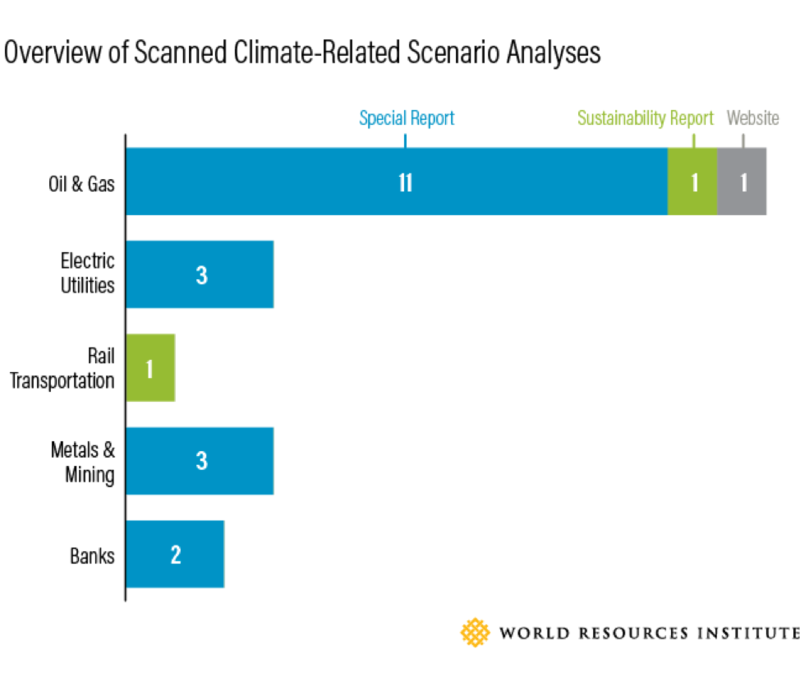 Our scan did not catch climate-related scenario analyses in any other TCFD spotlighted industries. The companies in this review, in the order shown on the chart, are: BP, Chevron, Eni, Equinor, Exxon Mobil, Marathon Petroleum, Oil Search, Santos, Shell, Suncor, Total, Pioneer Natural Resources, Conoco Phillips, Duke Energy, PPL Corporation, SSE, Aurizon Holdings, Glencore, Rio Tinto, South32, ANZ and Westpac. 2. Climate-related scenario analyses are often published in dedicated climate reports, not annual financial filings. The TCFD recommends that climate-related disclosures, including scenario analyses, be published in annual financial filings—core disclosure publications that generally carry the most weight with investors and regulators. This approach, however, is not the norm. Though we did see climate-related scenario analyses mentioned in annual filings, the majority of companies published special reports to disclose their analyses (see above figure). These reports, such as BP’s annual Energy Outlook and Suncor’s Climate Report: Resilience Through Strategy, often contain elements above and beyond scenario analysis, and are published separately from annual financial filings. Some companies disclosed their analysis in sustainability reports, and some, like ConocoPhillips, did not disclose their analysis in reports at all, simply referring to it in other reports or on websites. 3. Companies use a wide range of reference scenarios, or none at all, which inhibits transparency and comparability. The TCFD recommendations highlight how existing global climate-related scenarios—like those from the IPCC and IEA—are an important contextual and methodological starting point for conducting scenario analysis that can serve as a reference for companies when conducting their own scenario analysis. Some companies used only these third-party reference scenarios, some companies used only proprietary scenarios and some companies used a combination of both. Some companies, like Duke Energy, only used one scenario. The use of varying scenarios, all with different assumptions and reported metrics, which were often not unpacked, inhibits transparency within climate-related scenario analyses. This lack of transparency makes comparability, a focal point of the TCFD, extremely difficult. 4. All disclosures feature at least one 2-degree aligned scenario, but how companies treat those scenarios varies. The TCFD recommends that organizations conduct scenario analyses using at least one 2 degree C (3.6 degree F) aligned scenario. All disclosures from the last year did so. However, while some companies like Total use a 2 degree scenario as their base case, others like BP give little color on their 2 degree scenario, providing more analysis on scenarios with increasing carbon emissions. Many companies also used scenarios aligned with temperature rises above 2 degrees, and some of these companies, like Oil Search, have begun to analyze the potential impacts from the increased physical risks associated with higher warming scenarios. However, some companies used proprietary methods that are difficult to compare across companies, and without the use of a common reference scenario, even companies’ 2 degree analyses are difficult to compare. We are encouraged that companies are beginning to heed the TCFD’s recommendations, including those on scenario analysis. Our preliminary observations suggest, however, that most companies who are performing climate-related scenario analysis are still in the experimentation phase. For climate-related scenario analysis to reach its full potential as a useful tool to help companies and investors with decision-making, more work is needed to improve transparency and comparability between companies’ efforts. In this pilot stage, there may be value in experimenting with a range of potential reference scenarios. However, eventual convergence around a significantly smaller set of commonly accepted reference scenarios, or even just one, could help make the analyses more comparable and thus more useful. In the UNEP FI’s Pilot Project on Implementing the TCFD Recommendations for Banks, 16 global banks used three scenarios aligned with 1.5, 2, and 4 degree temperature rises, serving as an example of how this convergence could happen. In the absence of comparable scenarios, transparency takes on even greater importance. If parameters, assumptions and analytical choices aren’t spelled out, it is harder for investors to assess the credibility of a scenario. Lack of transparency also makes it harder for companies to compare themselves to their peers. Limitations around comparability and transparency inhibit capital flowing to the most responsible and strategic companies. They also keep investors from engaging with the most climate change-exposed companies to improve awareness and risk management. This in turn could slow down companies’ decisions to position themselves to thrive in the future.